The item is an ideal guitar for players of all ages and a great first guitar for young beginners. Featuring three single-coil pickups and five-way switch. The thickness and color of the picks, the color of the strap will be sent randomly. The body is made of solid basswood, and the fingerboard is made of rosewood, maple neck. It has a good strong tone and consistent notes from low to high strings. 5-way selector switch, single tremolo bridge, 3 single-coil pickups, 1 master volume control, 2 tone controls. 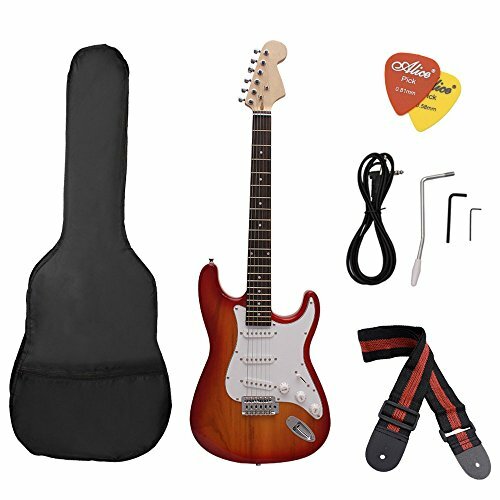 Comes with some accessories, such as guitar bag, picks and strap to meet your needs better.